Every year, The Scientist, a world-renowned science and innovation publication, looks to highlight “research products introduced in the past year that are poised to revolutionize the life sciences industry.” Half of the “Top 10 Innovations of 2014” list is made up of San Diego companies. This is no small victory. Companies as far away as Austria, with its HAP1 Cells developed by Haplogen Genomics GmbH, were ranked. In fact, no other city had more than one local company ranked. 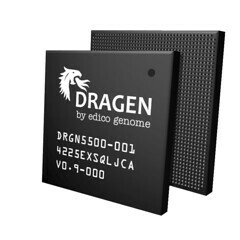 DRAGEN Bio-IT Processor (Edico Genome) – This bioinformatics processor reduces the computational cost and increases speed of analyzing genomic sequence data. MiSeqDX (Illumina) – This benchtop sequencer is the first next-generation sequencing tool approved by the US Food and Drug Administration for use in clinical diagnostics. HiSeq X 10 (Illumina) – This platform enables whole-genome sequencing at population-level scales at the long-sought-for cost of $1,000 per human genome. IrysChipV2(BioNano Genomics, Inc.) – This tool provides a high-throughput platform for the visualization of large-scale genomic structure, with applications for mapping, assembly, and evolutionary analyses. exVive3D Liver model (Organovo, Inc.) – This in vitro model mimics the macro and micro 3-D structure of the human liver, providing an experimental system that closely models in vivo human liver function. With a strong concentration of research institutes, San Diego has made a name for itself as the genomics capital of the U.S. All of the San Diego-based innovations, with the exception of the exVive3D Liver model, are classified as genomics innovations. Growing this base of innovative companies is a key focus of EDC’s work. In July, Illumina announced its plans to expand in San Diego, thanks to a 1.5 million tax rebate from the City of San Diego, which will retain and create 300 well-paying jobs locally. Because of this deal, Illumina will continue to develop its local footprint, and attract top scientists to the region. As San Diego becomes ubiquitous for life sciences innovation, this ranking reiterates that products and innovations developed here have the power to change the world.